Boat Stratos 191 FS, 175 hp. Fishing chairs (for 2 persons), aquariums, depth sounder. 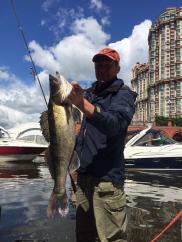 Feeding of the boat of the city of Serpukhov, Tarusa Pike perch, perch, pike, borsch is caught. Tackles in vain. Fishing with a speedboat. Catching a predator on spinning (all ways). Fish: pike perch, borsch, perch, asp, pike, catfish. Fishing on the float in the wiring. Fish: roach, bream, gusher, ide, podost, etc. The boat is equipped with an echosounder, a chart plotter, an aquarium, there are 2 fishing seats.